Find pet therapy in New York that caters to kids and adults with a variety of disabilities. 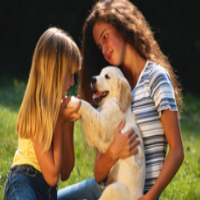 Read detailed information about all types animal assisted therapy in New York. Horse Therapy in NY from Experienced Professionals! 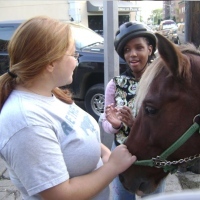 Providing therapeutic horseback riding to people in the New York area, Gallop NYC uses interaction with horses to promote the growth and function of mental abilities in a safe, supportive, and fun manner. Therapeutic riding uses the pleasures of horseback riding and care of horses to help people develop social, emotional, and physical goals. Under the direction of a certified riding instructor and the guidance of an experienced physical therapist, students can learn all the required basics of horseback riding. Gallop NYC has taught people with a variety of disabilities including autism, cerebral palsy, multiple sclerosis, traumatic head injuries, pervasive developmental disorders, mental retardation, and those who have suffered emotional trauma. For some of the best equine therapy in New York, contact Gallop NYC today! Not only a man’s best friend but a man’s healer too! Animal Assisted Therapy in NY is one of the highlights in medical progress. In recent decades, there have been countless stories of animals helping to improve and preserve the lives of children and adults with all types of diseases and disabilities. Trained dogs are being used to help keep children with autism safe and break the “freeze” that can afflict people with Parkinson’s disease when they try to walk. Dogs, cats, bunnies and birds are often brought to schools and institutions, as well as hospitals and nursing homes, where they help relax and inspire residents and distract patients from their health problems. 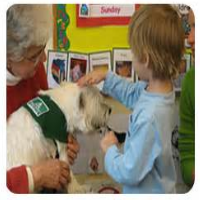 Good Dog Foundation provides animal assisted therapy in NY. The foundation offers animal assisted therapy services in a variety of settings such as prisons, nursing homes, mental institutions, hospitals and in the home. Assistance dogs can assist people with many different disabilities; they are capable of assisting certain life activities and help the individuals navigate outside of the home. This is proven and tested by countless patients. In what started as a safe haven for vulnerable and abandoned pets, the North Shore Animal League has grown over the years into a national organization that aims to improve human health through the assistance of animals. Throughout the metropolitan area of NYC, the North Shore Animal League serves rehabilitation centers for children and homes for senior citizens by bringing lovable pets to these people. 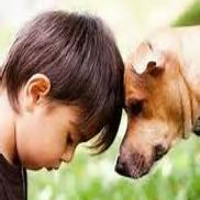 Research has proven that animal assisted therapy has therapeutic effects such as calming anxiety, improving sensuality and reducing stress among ailing people and children that suffer from mental, cognitive or other similar defects. The North Shore Animal League in New York leverages the healing power of pet assisted therapy and hence brings joy to ill and lonely people. The organization also runs a pet outreach program which allows pet owners to volunteer as partners. 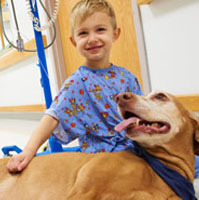 Since 2000, the American Society for the Prevention of Cruelty to Animals (ASPCA) has been on the forefront in bringing a sense of peace and joy to people hospitalized in special facilities through animal assisted therapy. On a regular basis, volunteers at the ASPCA visit nursing homes, children libraries and rehabilitation centers with certified dogs and cats. Pets have been viewed widely as having therapeutic effects such as reducing stress, stimulating mental faculties and improving communication in special needs children. If you require the assistance of therapy animals for a loved one, call ASPCA in New York and schedule an appointment. Cornell Companions is a pet visiting program run by the Cornell University College of Veterinary Medicine in New York. This program supports physically and emotionally challenged individuals by providing the opportunity to interact with trained pets. This program aims to make the most out of animal therapy, a treatment that allows children and seniors to experience the joy that comes with petting animals. Cornell Companions visits nursing homes, patients in hospitals and disabled children in special facilities. 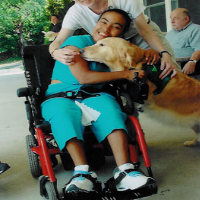 As a result, the team of pet handlers and certified therapy animals from Cornell Companions help to bring joy and inspiration to the sick, disabled, injured, lonely and depressed. K-9 is an animal assistance therapy organization that trains, evaluates and qualifies pet owners and their well-behaved canine friends as dog therapy teams in NY. The organization focuses on encouraging human-animal interactions that enable disadvantaged children, ailing patients and senior adults living in special care facilities to experience the love and companionship of pets. K-9 also teaches children and elderly people in nursing homes basic dog obedience. Thanks to this initiative, people far away from home and children with special needs get to experience the joy that comes with being a responsible pet owner. So if you own a dog, consider enrolling for classes at K-9 healers in New York. You will get the chance to participate in rewarding animal assisted visits that uplift the lives of those in need of emotional support. If you have a loving and friendly pet that enjoys interacting with people, joining the HERO Pets Uplifting People program in NY might be for you. Since its establishment in 1992, the HERO foundation for physically and mentally challenged people has continued to provide recreational opportunities to disadvantaged individuals through animal assisted therapy. The organization invites pet owners and animal lovers to volunteer in the noble cause of bringing together lovable pets and people with special needs. If you believe that friendly pets can improve one’s social, mental and physical health, join the HERO Pets Uplifting program and bring joy to the life of someone living in a special care facility. 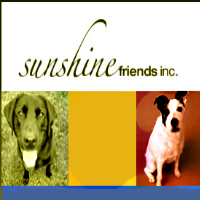 Sunshine Friends Inc provides animal assisted therapy services in New York. 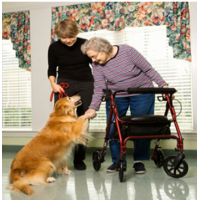 This organization brings lovable pets to individuals living in facilities such as nursing homes, hospitals, children’s organizations and rehabilitation centers. Pet visitation sessions focus on enhancing interactions between animals and humans. Not only does this uplift those living in special care facilities, petting animals also helps individuals to recover faster. In addition, Sunshine Friends Inc runs pet therapy training classes for dog owners. The organization vets therapy dogs and only takes in those that pass the American Kennel Club's Canine Good Citizen Certification. To become a volunteer, visit Sunshine Friends offices from 10:00am - 6:30pm Monday through Friday or from 10:00am to 4:00pm on Saturday. Join H.E.A.R.T to Build a Better Community! 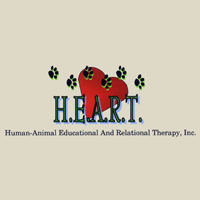 The Human-animal Educational and Recreational Therapy (also known as H.E.A.R.T Inc) is a non-profit pet program that offers animal assisted therapy services in NY. It visits various special care facilities with the aim of providing healing, learning and recreational opportunities to special care patients. 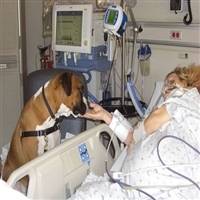 H.E.A.R.T pet visitations help patients to reduce the stress and boredom that is typical of institutional life. In addition, human-animal interactions have proved to be socially beneficial as well. H.E.A.R.T welcomes two and four footed volunteers with open arms. It also trains pets and their owners for the Pet Partners (Delta Society) certification. Therefore, if you own a well-behaved pet, join H.E.A.R.T Inc and help to build a better community! Since it was established in 1994, the Hudson Valley Visiting Pet Program has been bringing joy to thousands of individuals living in special care facilities. Volunteers from the Hudson Valley pet program visit a wide range of facilities with trained therapy pets. These lovable animals bring affection and companionship to individuals confined in retirement homes, children's homes, hospitals and other special care facilities. The mere presence of pets around special needs individuals helps them to distress and brighten up. The Hudson Valley Visiting Pet Program invites both animal lovers and pet owners to attend their occasional pet handlers workshops. So join them today and support their animal assisted therapy services in NY. Share Your Pet and Put a Smile on Someone's Face! Do you own a pet that loves being around people? Why not consider sharing your pet with others and bring joy to someone's life? The Positive Paws Visiting Pet Program provides pet owners with this opportunity. You can join this organization as a volunteer and take part in their pet assisted activities in NY. Before attending pet visits, Positive Paws trains pets and their owners for the Delta Society certification. 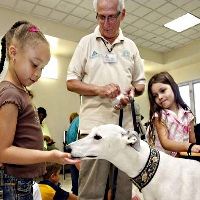 Once certified, therapy animals and their handlers take part in the regular pet visits to various facilities. So share your pet through Positive Paws Visiting Pet Program, and give back to the community in a positive way. Paws for Love is a pet visitation program run and organized by SPCA volunteers in NY. Trained pets of all types are welcome to apply for this program as well as people that love animals. SPCA uses this program to visit human service facilities such as hospitals, children's day care centers retirement homes and more. The unconditional love offered by these animals has a healing effect on residents and patients confined in special care facilities. Paws for Love helps to bring lovable animals and distressed individuals together, thus bringing joy into the lives of people through pets. Visit SPCA on their main website to learn more about their animal assisted therapy services in New York. If you prefer to visit personally, SPCA offices are open Monday through Friday from 8:00am - 5:00pm.